When Yan Ping (at left) was five he joined his mother (at right) when she was cast out of their village for having Leprosy. Although perfectly healthy, Yan sacrificed going to school in order to cook for the colony and has become figurative in the spread of the gospel. Many individuals who have Leprosy—often living in remote, exiled regions due to the cultural stigmas against the disease—have never had many everyday experiences you or I take for granted, such as having their pictures taken. The fear, anguish and disgust seen on the faces of those who cast them out when they first contracted the illness have plagued their lives, and so many have come to accept the lies that they are ugly and have no worth. In fact, on the rare occasion their photographs have been taken, they were done in an educational way, to document the heartbreaking progression this disease has taken on their bodies, such as open wounds and missing appendages. But to us at the Leprosy Ministry of Heaven’s Family, God has shown time and again how precious the leprosy-afflicted are to Him. Our team strives to communicate each individual’s intrinsic value in God’s eyes, but it is difficult for the diseased to accept this truth. Recently, the Lord inspired our partner Pastor Paul with an idea that might help communicate this immeasurable value to the residents of leprosy colonies: to photograph every leprosy-afflicted person he could find, and use it as a tool to share with them the love of Christ and the truth of their worth in His eyes. Pastor Paul tirelessly traveled from one mountaintop to the next, visiting numerous quarantined villages on this noble quest. After returning to the city, he had the photos made into 16-inch by 10-inch prints, and even had them framed! Next came the fun part—delivering these framed portraits to the leprosy colonies and personally presenting them to each person! It had been many, many years since any of these individuals had received a gift. This gesture was perhaps the most precious gift that we have given next to God’s Word and the gospel. Some were so touched that they were brought to tears by the kindness they received from Pastor Paul. A long-dormant sense of dignity and self-worth awoke within them. The message was clear and successful—that dignity comes from the truth that we are the creation of God, made in His image—and no sickness, disease or infirmary can diminish our worth one bit. Mr. and Mrs. Wang, a precious couple in Christ whose servanthood and boundless joy uplifts patients in the colony. They also evangelize to other colonies. 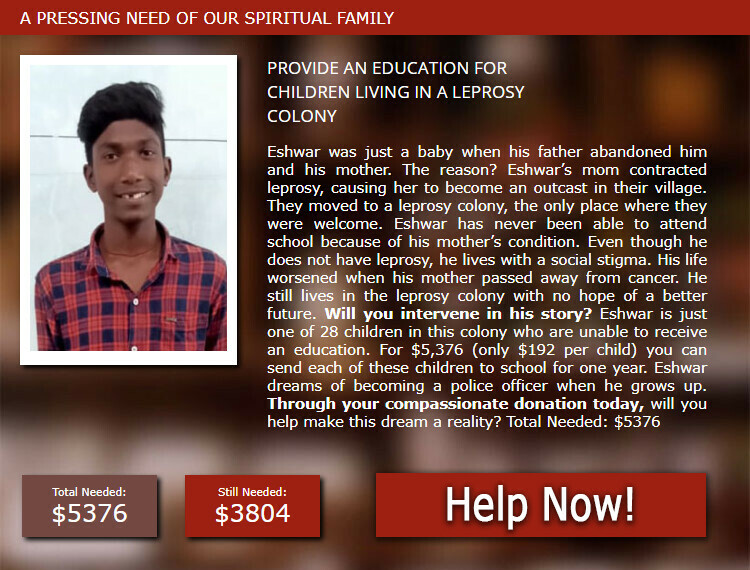 Thank you so much for your continued prayers and financial support of the Leprosy Ministry. Because of you, people who have been rejected by their families and quarantined from society have something to smile about. They’ve now heard the most important word they’ll ever hear: they are loved, cherished, and valued as sons and daughters of the King.